During my travel through Germany last year, I celebrated Oktoberfest in Munich, and marveled at the architecture of Berlin. I was pressed for time, but wanted to squeeze one more city into my visit. Heeding the advice from Go Backpacking's Facebook page, I visited Dresden for a few nights, en route to the Czech Republic. Despite nearly being bombed to oblivion toward the end of World War II, the historic buildings were all reconstructed. Today, given the attention to detail, you'd hardly know the difference. The city's historic center is compact, making it easy to cover most of the highlights in a single day. Here are my top 5 things to do in Dresden. 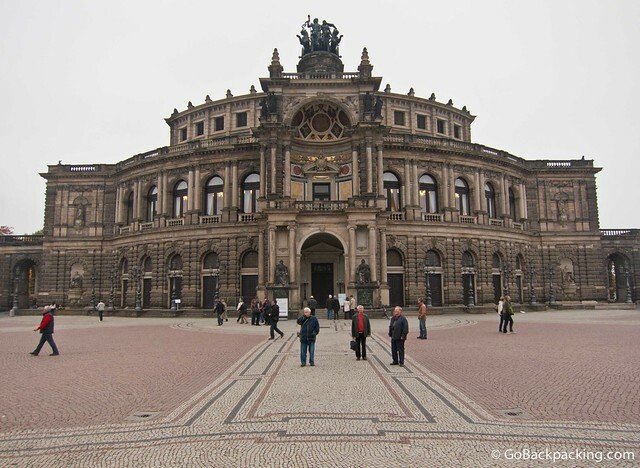 Casual visitors will appreciate the rich exterior design, while culture vultures can take a 45-minute guided tour ($12) to learn about the history and acoustics of the Semperoper. Tours are offered in both English and German. Planning to hit several highlights in Germany and Europe? Book your rail passes here! The palace also features the Dresden Porcelain Collection, one of the world's largest. Don't miss the Nymphaeum, an enclosure with featuring, you guessed it, loads of nymphs. 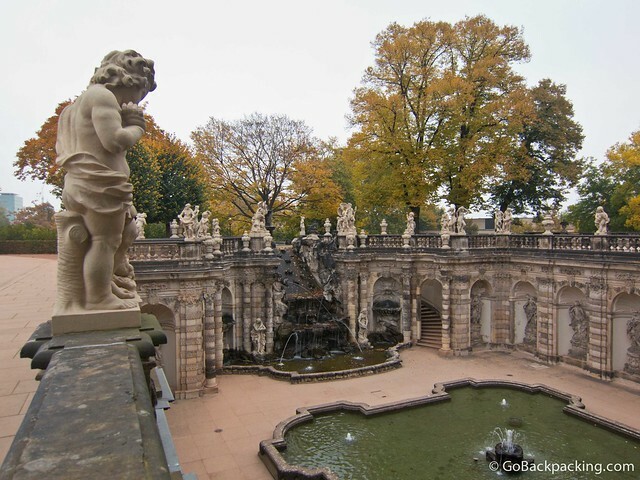 It's one of the finest Baroque fountains in Germany. 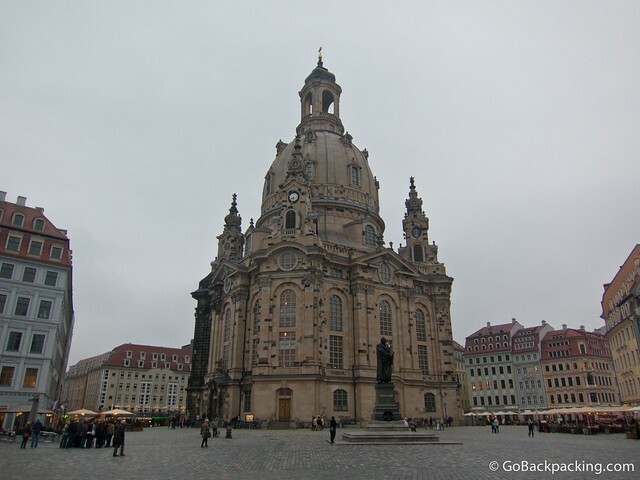 Situated in a large open plaza, the Frauenkirche offers 360-degree views of Dresden from its cupola. Even on a grey and dreary Fall day like the one I had, it was worth the $10 admission to get a bird's eye view of the city. Hopefully, you'll have beautiful blue skies when you visit. 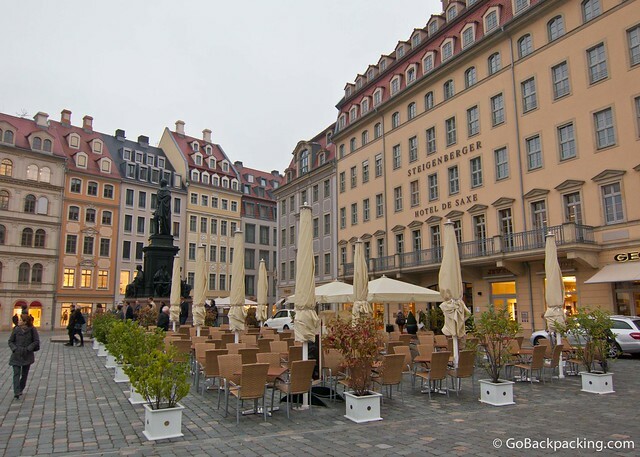 The Frauenkirche is surrounded by restaurants in all directions, and thus it makes the perfect place to grab lunch or dinner. It's here that I began to imagine how wonderful the environment would be in the Spring and Summer, when a mix of Germans and tourists are all out drinking coffee or beer, and enjoying the local cuisine. Alas, I was here as the city verged on what I imagine to be a bitterly cold Winter. 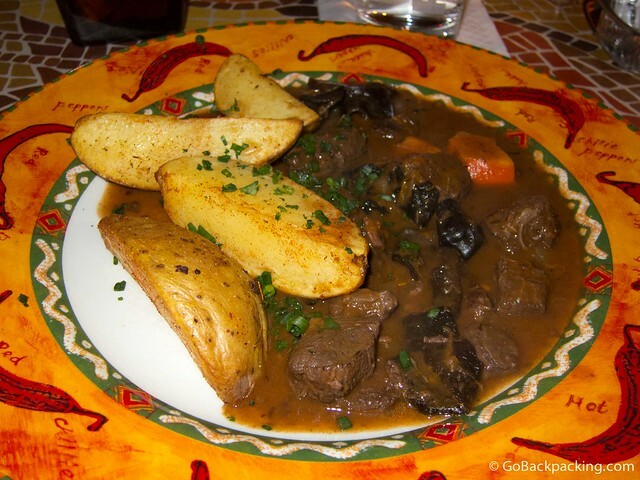 I was drawn into the warm glow of a restaurant-filled side street near the church. Gas heaters were in full effect. After casing the alley several times, I settled on Ayers Rock, an Australian-themed restaurant. I ordered the pumpkin cream soup refined by ham and cranberries ($5) to start, followed by a goulash of breeding emu, served with potatoes ($21). 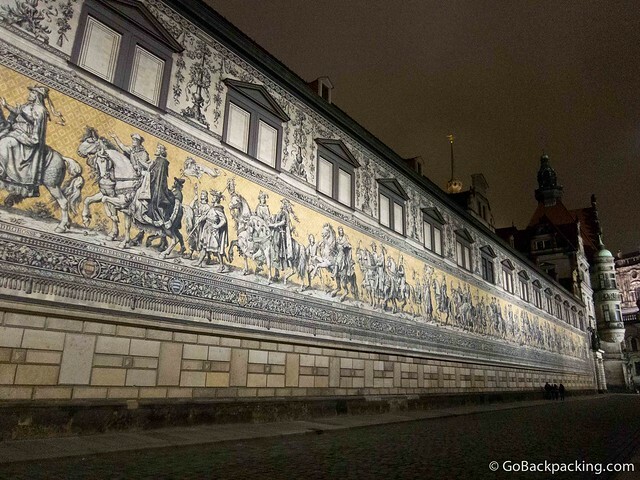 After dinner, on my way back across the river to the hostel where I was staying, I happened across the Procession of Princes, a 101-meter long mural depicting a procession of the Wettins, Saxony's ruling family in the 1870's. My first impressions of Dresden were quite positive, and my Spidey senses tell me it'd be a city I'd enjoy for at least a few weeks, if not a few months, during a warmer time of year. 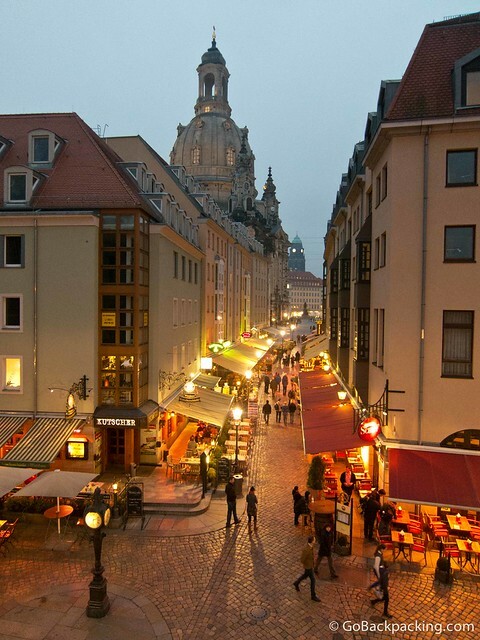 What's your favorite thing to do in Dresden? My travel to/from Dresden, Germany by train was made possibly by a Global Eurail Pass, courtesy of Eurail.com. Dresden really is a great Destination to visit – i love the old city center, the culture activities and the elbe beach down there. Your list is a good collection of the Highlights – I would add a tour with one of the Elbe boats to check out Pillnitz Castle! Thanks for the suggestion Steve. 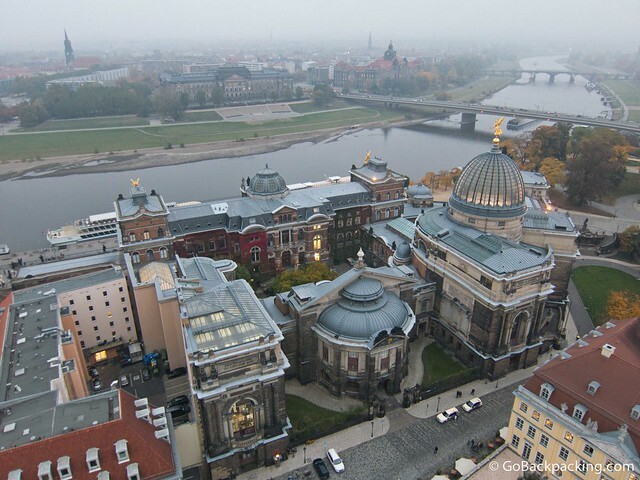 I’ve never heard of Dresden but it sure looks beautiful! Food looks yummy too. Desden seems like an interesting place. I do not think the opera would interest me but would certainly would love to go to al Fresco to dine. 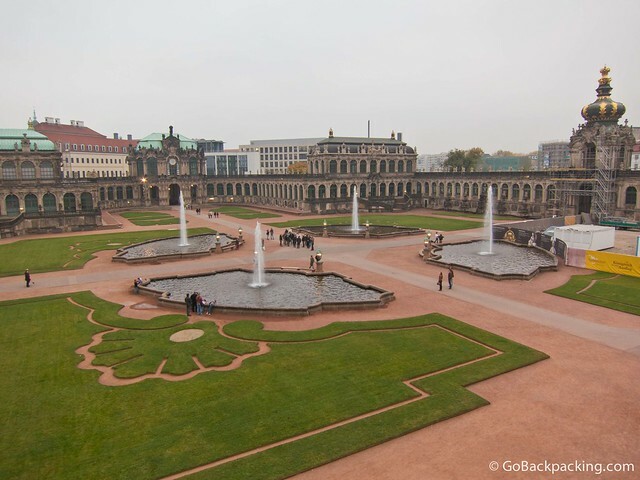 I absolutely love Dresden and this is a terrific list! I know this post is about things to do IN Dresden, but I just have to recommend Saxon Switzerland National Park. It’s about an hour southeast of Dresden, and I personally think it’s one of the most beautiful places in all of Germany! Everything I listed here can be done in a short amount of time because the historic city center is so compact. One place people might enjoy going is the beautiful Pfund’s Dairy (Molkerei). It’s a beautiful building and sells wonderful treats…like ice cream or cheese to eat in or take out. I’m sure it’s much more fun in Spring!